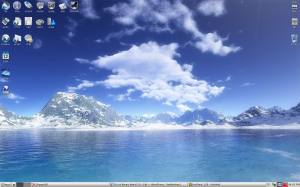 Back in May I reviewed Puppy Linux along with a bunch of other lightweight Linux distros. This month Linux Format Magazine included Puppy Linux 4.0 on their disc and I thought I’d check it out. I’m mainly focusing on how things have changed and improved or gotten worse since Puppy 3.01. I burned the disc and put it into my test rig computer. The first time it Kernel Panicked. So I told it to go completely in RAM like last time. Then it had some kind of “bread failed” kernel error and paused for 60 seconds. It tried to use UnionFS and kernel panicked again. I gave it one more shot with loading completely into RAM and ACPI off since that can sometimes wreak havok with Linux. It finally worked! Interestingly, when I rebooted, I had a hard time making that work again. Sounds like something the Puppy devs need to fix. However, I guess it could be something wrong with my burned CD. Puppy Linux is still using Joe’s Window Manager and it functions well. It does what it needs to do without being bloated. It looks like the changed up some of their internet programs. They got rid of transmission bit torrent for PcTorrent. PcTorrent is very simplified – looks like the wanted to make sure they didn’t have too much bloat. They have now moved from Gaim to Pidgin. They went from Xwget to Pwget. Does this stand for Puppy wget? I ask because they also have a program called Puppy-podcast-grabber. Looks like they have everything perfect for someone who is technical, but has an older computer they want to use. Some of the programs “look” a little scary for the newbie, I think. They don’t have nice, glitzy GUIs. But if the newbie didn’t care or if it was their only choice because someone donated an old clunker to them, I think Puppy Linux would serve them well. Also, I know it correctly picked up my motherboard’s integrated soundcard because I heard a dog bark when I first logged in. The rest of the software appears to be unchanged from my last review. Again, I like Puppy Linux and I think they continue to create a good lightweight distro with lots of programs. It seems to be very functional – unlike other lightweight distros it appears to have a program for each task you might need to do. My only quibble is with the weird boot-up problems I was having, but those are possibly caused by a bad burn or my DVD-ROM having some weird quirks. I think they have a nice new background so it doesn’t look quite as bootleg as it did before. Don’t just sit there reading about it…..